In 2017 I read 34 poetry collections (plus a good chunk of the Harvill Book of 20th Century Poetry), 38 novels, 11 collections of short stories, 18 non-fiction books, 12 literary journals, and 1 play. 37 of these were books I’d read before. I left two books unfinished – I gave up making myself finish stuff years ago. Pictured is my ‘best of’ list, if you like. 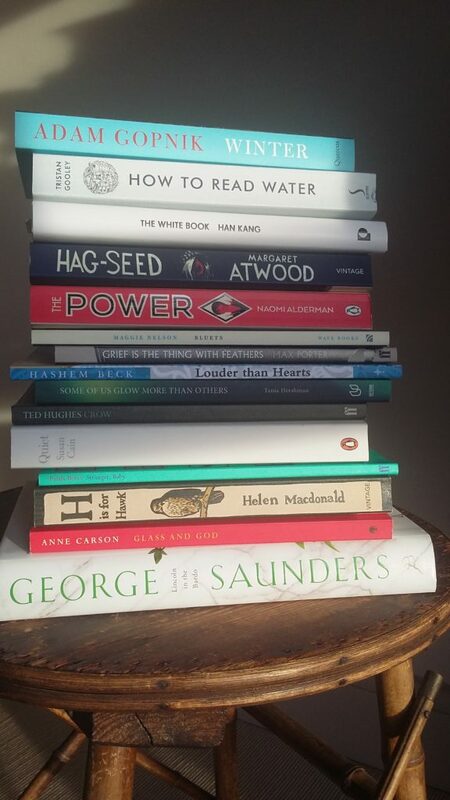 I was going to pick ten, but I was pulling these off my shelves and ended up with the pile above, to which I would also add The Dry by Jane Harper. Narrowing it down to some arbitrary smaller number seemed just far too much effort! These are the books that I have raved about during and after reading, that I’ve recommended to others, quoted from, and bought as presents. I would read them all again (some of them I already have). Thoughts going into 2018? I always feel like my re-read number is a bit high – I’m very prone to feelings of time-scarcity, so I end up berating myself for not having ‘used my reading time wisely’. But then, re-reading something like a well-worn Agatha Christie is a means of relaxation for my brain, I can’t maintain concentration on new or difficult literature the whole time. So in a way, I am using my time wisely on the whole, by not exhausting myself. I have to come to terms with the fact that I just won’t ever read all the books I want to. There are a lot of books out there. What about you? Have you read any of the above? Plans to? What have you enjoyed this year? I keep a list of books read in the Notes section on my iPhone. I’ve read 125 books so far this year, 28 of them non-fiction. I enjoyed The Power, but my standout favourites were Golden Hill by Francis Spufford and If We Were Villains by M L Rio. Oh, and Days Without End by Sebastian Barry, with an honourable mention for The Gustav Sonata by Rose Tremain. I also loved Eleanor Oliphant is Completely Fine, and The Party by Elizabeth Day.